Yeah, One of Those, Too. Lose weight. Be a better person. Read through the Bible in a year. Visit old friends. Learn to cook. Learn to play the piano. Yadda, yadda, yadda. 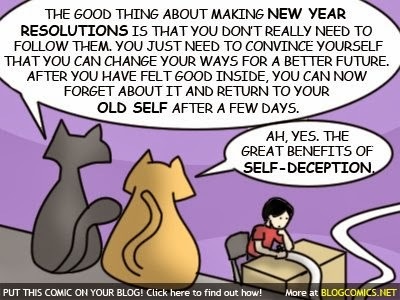 I'm tired of New Year's Resolutions. They. Don't. Work. Ever. That's why for 2014, I'm committing to getting a revelation, instead. A revelation directly from God. Here's the difference: A resolution generally means that we rely on ourselves; our own strength to make some sort of change in our lives that we've been unable to make before. So we resolve, with good intentions, that this will finally be the year we make the change for the better. Hogwash. The fact is, we can't do it on our own because we're not designed that way. We were created for intimate communion with, and worship of Jehovah God. Scripture is abundantly clear on this point: When we are weak, God is strong. It is our dependence on Him that gives us the strength to overcome our sins, our addictions, and our bad habits. The apostle Paul got a revelation direct from God: But he said to me, “My grace is sufficient for you, for my power is made perfect in weakness.” Therefore I will boast all the more gladly of my weaknesses, so that the power of Christ may rest upon me. (II Corinthians 12:9). I'm guilty. I'm guilty of resolving to do better. I'm guilty of repeatedly banging my head against the wall in frustration, because I can't get a hold of that thing that keeps me from being all I can be in Christ Jesus. So I'm giving up. I'm surrendering to God. I'm going to spend the next 365 days going after a revelation from heaven. And I pray that my revelation leads to a revolution.